An Oxford solicitors firm's promotion offering half-price divorces to couples going through a break-up has been labelled "tacky" by a religious leader. Hine Solicitors, in Summertown, said it was slashing prices from £800 to £400 to attract new business in January. Katie Lowndes, from the firm, said it was acting "responsibly" and was not "encouraging" people to get divorced. The Bishop of Oxford, the Rt Rev John Prichard, said it was "a bit tacky" to try to profit from people's misery. 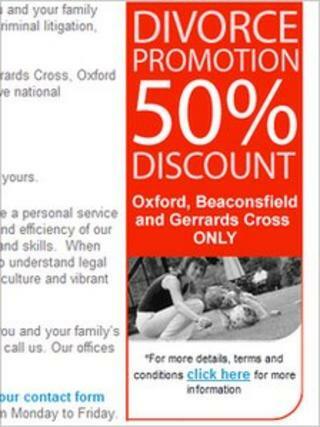 The firm, which has recently moved to the town, has printed leaflets featuring the offer as well a promotion on its website. It said that anybody who sought a divorce through them would always be offered counselling and mediation. Ms Lowndes told the BBC that more divorces were reported to happen in January. "I don't think our promotion would increase or encourage people to get divorced," she said. "I think if a couple is going through difficulties and they have decided together that they want to have a divorce, then of course they would probably be looking [at] going to a solicitor in January anyway. "They really need to be sure that it's the right decision for them, because divorce is a big life-changing decision and it shouldn't be taken light-heartedly." Mr Prichard said he would have preferred half-price mediation, encouraging couples to stick together. "It's a bit tacky isn't it, to go and try to make a profit out of other people's misery," he said. "I think couples in distress could do without that kind of encouragement. "I do think it's a bit ingenuous to say that the solicitors are not trying to encourage people towards divorce - if they are not trying to encourage by a half-price offer then why offer it? "I think its appealing to the wrong part of our brain and emotions at this time. "Marriage is precious and by far the majority of people really do look for a life-long partnership and really do want it to work."